Metal Gifts, Hardware, Household, Stationery and Key Chains. Adaptor is a person that adapts or a device that converts attributes of one device or system to those of an otherwise incompatible device or system. Adapter for 7-pole socket to 13-pole plug. It can transfor from 7-PIN to 13-PIN. 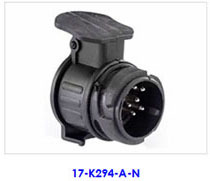 Adapter for 13-pole socket to 7-pole plug. It can transfor from 13-PIN to 7-PIN.